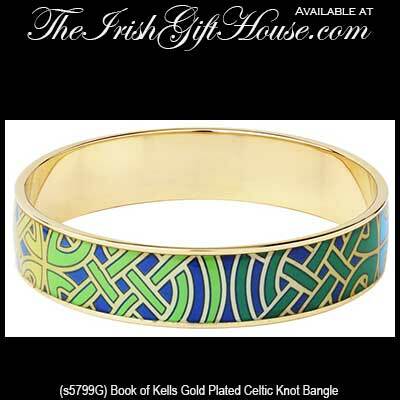 Book of Kells, Gold Plated and Enamel, Celtic Knot Cuff Bangle Bracelet from Solvar Irish Jewelry. This gold plated Book of Kells Celtic cuff bangle with an enameled Celtic knot design measures 5/8” tall x 2 1/2" inside width. The Book of Kells bracelet is gift boxed with the Celtic knot history and it is crafted under license by Solvar Jewelry, Dublin, Ireland.